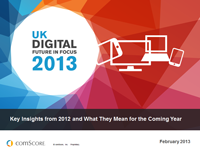 2013 UK Digital Future in Focus - Comscore, Inc.
Comscore presents the 2013 UK Digital Future in Focus, its report on prevailing trends in changing digital behaviour, online video, mobile and search, including a special review of social, shopping and silver surfers. 44.8 million people in the UK used the internet in December 2012, a 5 percent increase over the year.Brits also spend more time online than any other European country, representing a fertile ground for digital marketers and advertisers to engage with their target audience online. UK online video audience grows by 8 percent over the year, whilst mobile video audience grows by 262 percent. Page views from Non-PCs reached an all-time high with nearly 1/3 of all UK page views now from mobiles and tablets. In the UK, 64 percent of mobile users had a smartphone, but already 82 percent of new phones acquired in December 2012 were smartphones. The rapid adoption of internet enabled devices is resulting in a more fragmented digital media landscape. Google maintains its strong hold of the search engine market, capturing 91 percent of all UK searches. As the search market continues to evolve, Brits are also turning to non-traditional search sites such as Amazon and eBay to search for information and products. Facebook remains the leading social network in the UK, capturing the largest amount of unique visitors. However, there are some rising stars on the horizon - Tumblr, Instagram, Pinterest and Goodreads – that have all witnessed strong growth rates over the year across both PC and mobile. Online shopping has long become the norm with 9 out of 10 UK internet users visiting retail sites and mobile shopping is escalating with 1 in 5 Brits using their smartphone to purchase a good or service in December 2012.